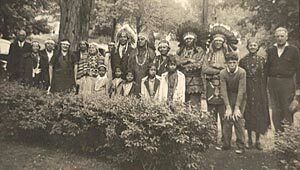 Three hundred and fifty years ago the Reverend John Eliot established Hassanamesitt, one of fourteen "praying Indian villages" in southern New England established to encourage Native Americans to convert to Christianity. The 190-acre Hassanamesitt Woods property in Grafton is believed to contain the core remains of the praying village. The land has significant cultural importance to the Nipmuc Tribal Nation and further archaeological investigation of the site will offer a unique window to the interactions between native and English populations during the 17th century. Previously, the woodland was under agreement for the planned development of more than 100 homes. Working with the town of Grafton, the Grafton Land Trust, the Nipmuc Nation, and the state, TPL purchased the property and held it off the market until funding could be secured to protect it in 2004.